Margaret Thatcher’s fancy funeral will be held this coming Wednesday. Along with the deceased prime minister, can we bury her most favorite slogan, too? Margaret Thatcher’s fancy funeral will be held this coming Wednesday. Along with the deceased prime minister, can we bury TINA, too? For thirty years we’ve lived with TINA: “There is No Alternative.” Thatcher deployed her most famous slogan to mean that certain debates were over, especially debates over capitalism. Globalized capitalism, so called free-markets and free trade were the best ways to build wealth, distribute services and grow a society’s economy. Deregulation’s good, if not God. This week, as the canonization of Margaret Thatcher has played out, it’s clear that while Maggie may be gone, TINA lives. Looking at the data from the British Office of National Statistics compiled by The Guardian, here’s what I see: in the Thatcher years, unemployment shot up, manufacturing spiraled down and poverty grew. Scratch that—poverty almost doubled, from 13.4 percent to 22.2 percent. Inequality rose. No alternative? Even Thatcher’s quip “the lady’s not for turning” should remind us there were other routes we could have traveled. Thatcher wasn’t just stubborn, she was specific. She dragged the nation down a defiantly neo-liberal path. One of her first moves on coming into office was to liberalize capital markets—think NAFTA a decade earlier. Governed by the belief that free capital provided the answer to the economic difficulties experienced in the 1970s, Thatcher, like Reagan, tore down tariffs. Money roamed free and went where it was wont to go—offshore, where profits were bigger because wages were lower—and to tax havens, where big money could evade the taxes it would otherwise (like the rest of us) have to pay. In a damning new documentary from Dutch national TV, former McKinsey-researcher-turned-journalist James S. Henry estimates that some 21 to 32 trillion dollars are parked in no-tax tax havens today—only a third of it from the developing world. 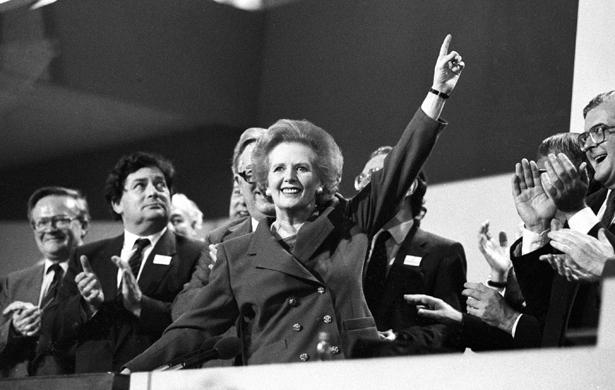 British accountant and author Richard Murphy credits Thatcher with starting the trend. TINA would call the practice delicately “tax minimization” or “neutralization.” Murphy calls it breaking the law. It’s not just “the way it is,” it’s the way liberalizing capital markets made it. Public coffers from London to the Potomac are trillions of dollars poorer as a result. Globalize capital, “neutralize” taxation on the biggest money and where’s a government to go for cash? To little-guy-consumers via the sales tax. While much has been made of the changes Thatcher made to income tax—lowering the rates on the rich and raising rates below—the most effective way her government shifted tax burdens from top to bottom was by nearly doubling the value added or sales tax (from 8 to 15 percent). While big businesses could park money abroad in tax havens, everyday consumers were taxed at the checkout, every time we bought bread or lettuce or socks. Was there really no alternative? Some squealed against the onslaught, but it was hard to hear what they had to say, because with the turn in the economy came a shift in the democracy and the media. In TINA’s world, dissenters were what Thatcher called the mineworkers: “the enemy within.” Unions may have needed reform; but working people needed a voice. Under Thatcher they lost the loudest one they had. Union membership by Britons in the Thatcher years shrank from one in four to one in eight. Part of the decline was a consequence of all that competition with low-wage workers in non-union countries and foreign bosses living too far away to shame. Part of it was due to the brutal “brass knuckle” tactics of security forces in response to strikes. Union mineworkers were bashed on the head by mounted police on picket lines; their wives and children were stopped at police checkpoints when they tried to take their message South; their communities vilified in the news; their supporters were red-baited in debates. In TINA times, who was left to even speak about an alternative? Union towns and poor and immigrant neighborhoods saw unprecedented levels of police. Financiers saw less. In the city of London, the “Big Bang” delivered “deregulation.” Clamping down on critics, Thatcher freed up finance. Again, it was a choice. A sort of Glass Steagall years ahead of Clinton's, the Thatcher administration’s decision to put growth first, regardless of the cost to people or the planet, meant doing away with boring, cautious banking, removing regulation, permitting integration, encouraging financialization and demonizing scrutiny by “red tape” bureaucrats. London, like Wall Street, loved all that and shared the love with politicians. Influence scandals, corruption and the crash economy grew. And where the money went, so went the media and the press. Going to London these days, sometimes feels like going to a different planet… The ten richest boroughs of London are now worth in real estate terms the same as Northern Ireland, Scotland and Wales added together… A third of the population was born in another country. Belgravia is exclusive and also mostly devoid of living and breathing people. The streets have become prestigious property parks for (non-tax-paying) foreign wealth. Was there really no alternative? To name but one, Thatcher inherited a North Sea Oil boom that turned the UK into a net exporter of oil, generating trillions of dollars of revenue, more oil than Iraq, Kuwait and Nigeria, and more gas than Saudi Arabia by the end of the 1990s. Norway used their oil profits to plan for the future and an aging population by building up a soveriegn wealth fund. Venezuela, under Hugo Chavez, used theirs to help the poor. Britain, let’s just say, did neither of those things; the lion’s share went to pay unemployment benefits. Now, with no national investment bank and no plan, the oil has almost gone. The country’s importing once more. Could there have been an alternative? What do you think? C'mon. At Thatcher’s funeral, let’s bury TINA, too. Chileans living under the Pinochet dictatorship know Thatcherism all too well. Read Dave Zirin's take.